September | 2010 | I HATE HATE!!! Well who’d a thunk it! A high-rankingUK police officer -Tim Hollis, chief constable of Humberside police no less – has called for possession of small amounts of cannabis. He said that the current approach to policing drug trade and drug use could offer only a “limited” solution to the UK’s drug problem, a tacit admission that prohibition has failed. So now he wants cannabis decriminalized, and the money saved to be used instead in the “war” against “hard drugs”. Before we put Hollis on a podium and announce him the saviour of dope smokers everywhere, it’s worth remembering that Hollis has been a policeman for a very long time, and is the chair man of ACPO’s drugs committee – and he has only recently decided to back decriminalization. So for years he has backed the current “war” on drugs and its sentencing guidelines. Hollis isn’t doing this because of some “road to Damascus” revelation -he has seen the spread of decriminalinalization of cannabis spread across the EU, and he doesn’t want to be seen as some kind of Luddite nay-sayer when the debate starts here (in the UK). But whatever his motives may be: good luck Hollis. If a few more “respectable” figures publicly called for decriminalization, maybe things would change. Both David Cameron (the Prime Minister) and Nick Clegg (Deputy Prime Minister) have wondered whether the current policies are at all effective. Cannabis has been discreetly decriminalized in Portugal; and the “long term experiment” of semi-legalization in Holland has brought with it a decrease of theft and the dealing of hard drugs. It should be pretty obvious to anyone with half a brain that prohibition will work. Look at the US experience: banning alcohol just lead to a semi-“underworld” of speakeasies, and helped a bunch of unscrupulous “businessmen” like Al Capone make a lot of money very quickly. A lot of the monied families in the USA owe their wealth to bootlegging during Prohibition. And the prohibition of drugs in the UK is having a similar effect. A number of shadowy figures are getting very rich by selling us what we want at hugely inflated prices. If prohibition came to an end, these gangsters would have no income stream, and the simple honest cottage-industries of growing and preparing cannabis would be open to the average joe with room for a few plants (as long as the cigarette corporations can be left out; which is to everyone’s advantage, methinks). So what do you think about this? Should Hollis be revered or reviled? Sure, he’s saying nice stuff about dope now – but what about all the crap he’s spewed on the subject before? Use the Comments to tell us what you think. Police officer jailed for 6 months. Is that all?!! Sorry about this: the story is a few days old now, but I didn’t know about it until yesterday. So here we are – let’s get on with it. A woman called Pamela Somerfield was arrested for sleeping in her car. She was sleeping there because she’d had a row with her boyfriend. But that’s irrelevant. It isn’t illegal to sleep in a car in the UK; but she wasn’t subsequently questioned or charged with anything, so that must be why she got pulled. During her stay at Melksham police station, Wiltshire, Somerfield was a bit naughty, at one point she “slipped out of her cell” (how did she manage that? Was she so thin she could slide under the door?). Anyway, this made custody sergeant Mark Andrews very cross indeed. So cross that he dragged Ms Somerfield by the hair through the custody suite and hurled her head first into her cell. Her head hit the concrete floor so hard that an ambulance had to be called. On the way to hospital, blood began to put from her nose. While in the ambulance she really thought she was going to die. Andrews’ attack on Ms Somerfield was caught on CCTV. You can see an edited version here. One of Andrews’ colleagues reported the incident, after which Andrews was suspended on full pay pending the court decision. He has now been sent to jail for 6 months. 1. You can see clearly on the CCTV footage that there were several police officers present during the attack. So how come only one officer reported him? I think the other officers should be sent to jail themselves (unlikely) or at least fired (also unlikely…). 2. Why only ABH? And why only 6 months? The prosecution could easily have charged Andrews with a more serious offense, which would have been kicked up to crown court automatically and given the judge the power to dish out a much more serious sentence. 3. Why was Andrews suspended on full pay? What kind of message is that meant to say to the public? “Don’t mess with us. Cos we’re the police and we can get away with anything!” That’s the message I’m picking up here. I think that all police officers found guilty of a crime should be punished to the full extent of the law. Maybe introduce a new law that mandates a jail sentence of at least five years for cops who break the law. Who agrees with me? 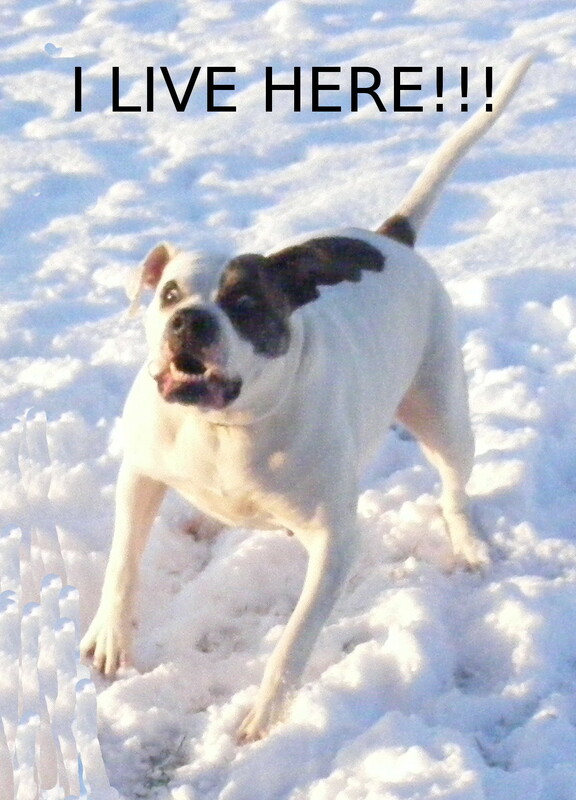 I’ve got an American Bulldog (note, this is not the same thing as the so-called “American pitbull terrier“, which breed was specifically banned in British law as a banned “dangerous” dog). My bulldog is extremely friendly, but she barks loud and often, and some of the expressions she pulls would definitely scare strangers. Anyway, she spends her day going out of the house to the garden, then back again, barking at cats, dogs and children it encounters. The garden is securely fenced. But what’s worried me recently is this new family who’s moved into the neighbourhood. I’ve seen these idiots’ kids actually sticking their fingers through the fence so they could “touch the doggy”. All this reminded me of a story/urban myth/whatever it is that claims a dog owner who put up a BEWARE OF THE DOG sign is admitting he knows his dog is dangerous and therefore is more liable for any dogbites than an owner who “didnt know” their dog might bite. From one point of view that seems quite reasonable… if you know your dog bites you should muzzle it or something… but from another POV it’s ridiculous: you’ve gone out of your way to inform possible trespassers that they might get bitten. I decided to look around on the internet for any pointers on this (all the time remembering that the net is full of people from different places, with different rules, so I was unlikely to find a definitive answer. And I found a typically self-contradictory discussion on snopes.com. It seems that in some jurisdictions, a BEWARE OF THE DOG sign can be seen as an admission by the dog owner that his animal is a potential danger. Whereas in other places such a sign is considered “fair warning” to potential trespassers and if someone gets bitten it’s his own stupid fault. Which is the argument I agree with – if some fool enters my property knowing it’s guarded by a big barky dog, awful things may happen and it’s the trespasser’s own fault. But laws are rarely sensible. And if one of my new youthful neighbours lost a few fingers through teasing my dog, it’s quite likely that my poor mut would be dragged off for a lethal injection. Doubleplusungood, eh? But apparently there are ways around this. One such is a picture of the dog looking suitably horrible, and a message saying something like I LIVE HERE!!! This isn’t a threat – it’s just informative, right? I’m not telling potential thieves and trespassers that they may get eaten if they enter my garden; I’m proudly showing off my pooch. Kid: Does your dog bite? Me: All dogs bite! That’s why they have teeth! Anyway, I want some feedback. Is the sign threatening? Or is it just informative? Should I tie the pic to my fence or keep it in the house? Please leave a Comment: I’d really like to know what people in general think of this. Cheers. DEFCON 18 Presentations audio files available for free download. So DEFCON 18 has been and went. Who went? No, neither did I. I live thousands of miles from Las Vegas, on the wrong side of an ocean, and I’m not too sure I’d be allowed into the USA anyway. So I just love those wonderful audio and video files of the DEFCON talks and presentations that eventually appear on the DEFCON site. Yes, eventually is the operative word. The videos and audio files aren’t posted immediately for free download. The DEFCON people want to squeeze a bit more blood out of the stone first, so they sell the material on DVDs for a while, before letting us uncouth freeloaders fill our boots. So, if you want to buy a DEFCON 18 DVD, go to defcon.org – I’m sure you’ll find someone there only too pleased to take your coin. But if you’re like me – you want it, you want it free, and you want it now – go check this site. You’ll find mp3 files of most of the talks there for free downloaded. As of this date (14 September 2010) there are no links to get the videos. And some of the “mp3 links” aren’t actually links to mp3 files at all – some point to .BIN files, and even though I run a Linux box I don’t like to click on links to binaries. Call me careful, or paranoid – I don’t care. If you want to see what’s in the .BIN files, download a few and let us know what happens in Comments. Even though I’ve only been able to find audio files of the presentations so far, it’s possible that the DEFCON people can unwittingly help us out. If you go to defcon.org and browse to the DEFCON 18 archive page, you’ll find that white papers and slides for some of the talks are already available. Match the right slides with the right mp3 file, and it’ll be like you were actually in Vegas. In fact, I think I’m gonna go down to the casino floor and play some dice before the next presentation starts. I gotta catch Dan Kaminsky’s talk, that guy rocks!! “Weapons haul” found by police in Worcester, UK… but it’s all a load of crap, as usual. Look at the pics, and the other pics available out there in the intertubes: see how clean, and new this ordnance is. To me, this makes me wonder: the army boys told the cops that the munitions were replica and harmless; and the cops decided to act like real super-cops. The cops didn’t put the munitions in evidence bags or in any way try to avoid being photographed. They wanted to be photographed; they probably told the photographers to turn up. 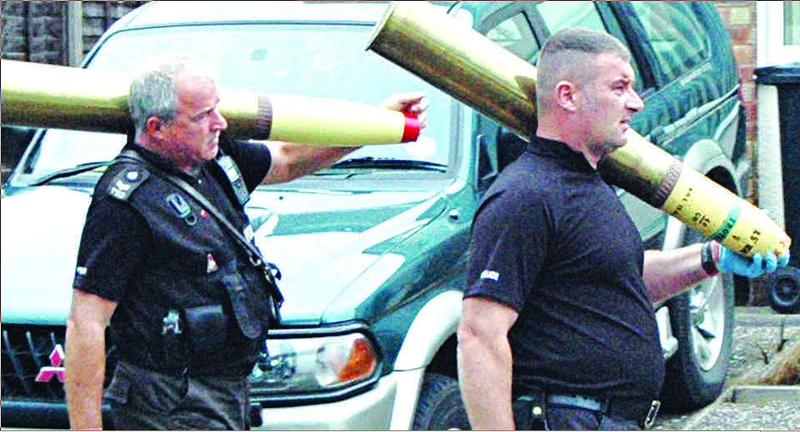 Now they’re a bunch of hard, dedicated coppers who carry military weapons with complete disregard for their own safety. But what about the public’s safety? Don’t worry, the bombs are only toys. But shh don’t tell anyone. Even before the truth came out, I was suspicious. The nature of the weapons I saw pics of and read about was far too modern to be anything but replicas belonging to replica collectors, war re-enactors and the like; if they were real, they were something to be very concerned about. A terrorist organization amassing a cache like that would indicate that something’s going to happen – and there are more caches like this. The fact that all the news editors must have been pretty sure by deadline time that the munitions were fake and almost certainly legally held didn’t stop them from making it seem a terror incident. And now the truth has come out: take a look at the Worcester News website and you’ll find this puff piece, making sure that no criminal charges have been brought against him. Graham Lane is a 65-year old collector of deactivated and replica firearms, and he’s a gun club chief. So this presumably highly-trained army bomb disposal specialists were unable to tell the difference between real explosives and pretend stuff? Sneck, no wonder the casualty rate of innocent Afghanis being brutalized, tortured and even killed. And we’re no safer here. Go out in the street and play with toy guns: how long before an armed response unit turns up and wastes some teenager with a water pistol. Doesn’t this make you feel safe at night? You are currently browsing the I HATE HATE!!! blog archives for September, 2010.